It is supposed to be hot in July in the United States, so we want ice cream. In 1984 President Ronald Reagan proclaimed July as National Ice Cream Month. He also established National Ice Cream Day as the third Sunday in July. So Americans and friends of Americans, it is your patriotic duty to eat ice cream today. 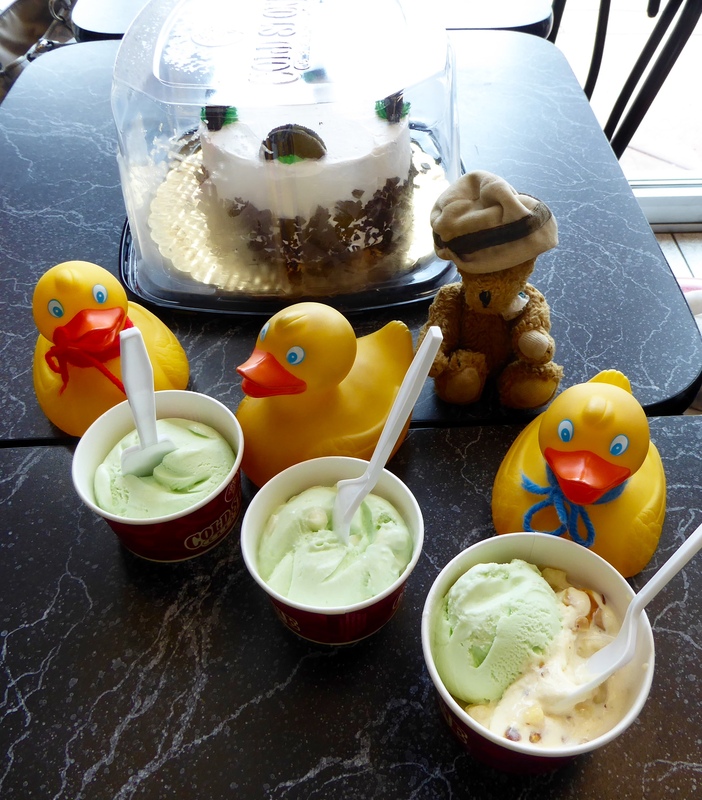 The Colorado Traveling Ducks, with our friend Channel the Bear, took our humans for ice cream to celebrate. We all decided on mint ice cream. We are at Cold Stone Creamery eating ice cream. Some of us have white chocolate chips mixed in our mint ice cream. What flavor ice cream will you enjoy today? Hey humans! Let’s cut and eat that ice cream cake. Yum. This entry was posted in Holidays, Uncategorized and tagged Colorado Traveling Ducks, mint ice cream, National Ice Cream Day, President Reagan. Bookmark the permalink. Every day should be ice cream day! And what is that delicious looking concoction on the table behind you, Ducks? That yummy ice cream cake was for later. Justin can be my job coach. Love his ice cream post. Thanks for reading and commenting. Justin loves doing work experience, especially if it involves food. Your ice cream cake looks divine.